Music haiku - what could be more appropriate for me, especially today as I prepare to return to my job as an accompanist for high school singers. Music is a huge passion of mine- playing it, performing it, sharing it with others. 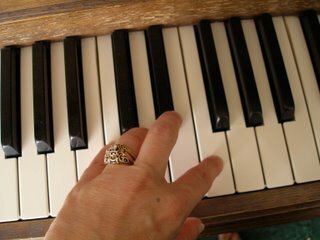 I've considered myself a musician for at least 44 of my 50 years, and I hope I can continue practicing (forgive the pun!) this art for at least 44 more! Applause like fine wine richly rewards mind and heart - encore please!